History: Varanasi is the holiest of Hindu holy sites, a pilgrimage centre from ancient times. It is said to be the oldest continuously inhabited city in the world, referred to in the Rig Veda and other ancient texts. Author Mark Twain's comment on Varanasi is much quoted: "It is older than history, older than tradition, older even than legend, and looks twice as old as all of them put together." It is also revered by Buddhists, since the Buddha preached his first sermon at nearby Sarnath. Political history: Like much of the country, the Varanasi Lok Sabha seat was a Congress bastion during the first three general elections. The Communist Party of India rose as a serious challenger in the 1960s, but the Congress soon reasserted itself under Kamalapati Tripathi, the most important political leader the city has produced. Since 1996, the BJP has held sway over this seat, winning it repeatedly, even as its influence plummeted elsewhere in UP. Industry: The city is renowned for its silk saris, with intricate zardozi work and costing the earth, must-have bridal wear at most Hindu weddings. 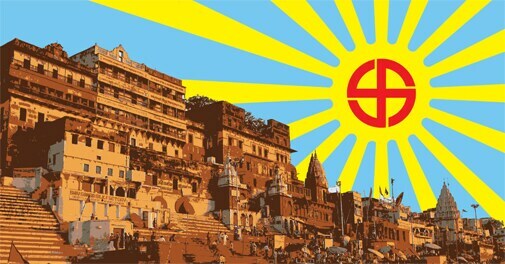 Education: Varanasi has been a centre of learning from ancient times. Today, the Banaras Hindu University, set up in 1916 by freedom fighter and scholar Madan Mohan Malaviya with donations from the general public, is still among the country's top institutions of higher learning. It ranked No. 1 in India Today's listing of top universities in 2013. Its engineering college was given 'IIT-status' in 2011. Culture: From Tulsidas and Ravidas to Kabir to Premchand, Varanasi has produced an array of top notch poets and writers. In music too, its contribution is enormous - the Banaras gharana, a particular style of playing the tabla, originated here. Its leading musicians include sitar maestro Ravi Shankar and shehnai virtuoso Bismillah Khan. Chaos broke out at the sea-themed corner of the T-Rex Cafe at Walt Disney World in Orlando, US, after a giant fish tank burst without warning. Startled diners rushed out of their seats to avoid getting wet, as water, carrying fish with it, flooded the room. Workers used nets and empty trash cans in a desperate bid to save the fish. Luckily they were all rescued. The restaurant, despite the incident, did not close for even a day. A scrap dealer in the American Midwest could not believe his luck when he found a $33-million Faberge egg at a bric-a-brac market. The ornamental egg is one of the 50 Imperial Easter Eggs designed by Carl Faberge for the Russian Royal Family. It contains a Vacheron Constantin watch, which Emperor Alexander III gifted his wife Maria Feodorovna for Easter in 1887. This was last seen at a show in St Petersburg in 1902. A Rajya Sabha MP, K.V.P. Ramachandra Rao, has been indicted for bribing Andhra Pradesh officials to get a mining licence for minerals used to make titanium based products. So whats new? The indictment is not by any Indian court, but by a grand jury in the US. Five others have also been charged, including a top Ukraine businessman. How does this fall under US jurisdiction? US prosecutors claim it is because US financial institutions were used to transfer the bribe money.